Not so many decades ago, the taming of America’s “Wild West” was still only grist for history books yet unwritten. In today’s civilized, organized, regulated, and legalized society, it takes some imagination to visualize what life and “law and order” must have been like, back then. For better or for worse, one of America’s most recognizable icons has emerged from the turmoil of those Wild-West days to become embedded in our national consciousness. The Colt Single Action Army (SAA) revolver is synonymous with the “Wild West” in the minds of Americans. It is virtually the only sidearm portrayed in the wildly popular, early western movies and television shows. Gene Autry, Roy Rogers, and Hopalong Cassidiy would not be caught dead without Colt SAA revolvers in their holsters…or maybe they would! The SAA was called “The Peacemaker” and for good reason – its ubiquitous presence in the holsters of frontier sheriffs who were duty-sworn to keep law and order in the “new territories” of our expanding nation. I sincerely hope that readers who instinctively do not like guns will not stop reading, at this juncture. My interest in the iconic Colt SAA is purely historical and reflects no inclinations on my part to argue the pros and cons of firearms in today’s society. As you will soon appreciate, the story of Samuel Colt and his firearms company is an integral part of our country’s history and industrial heritage. Surprisingly (to me, as well), there is an aesthetic case to be made for the Colt SAA which contributes to its iconic stature; I will explain. As with the automotive industry which blossomed precisely at the heyday of the Colt’s popularity, there were also plenty of would-be competitors in the firearms business, but, like the Model T Ford, only one sidearm would emerge an icon in its field…and that certainly was the Colt SAA revolver, usually in its storied .45 caliber. 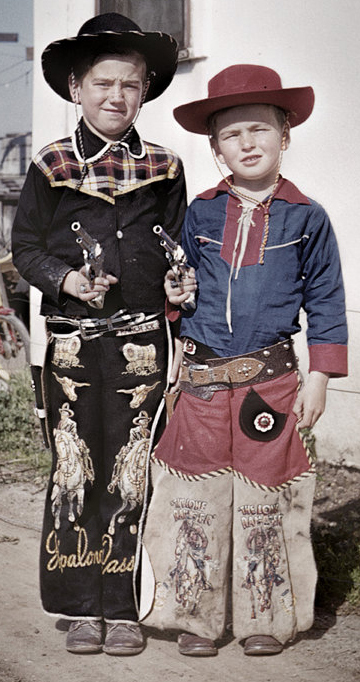 Millions of us senior males recall with great fondness playing “cowboy” in our early youth. Who among us does not recall the cheap, die-cast cap guns clearly modeled after the Colt SAA …and that distinctive, sharp gunpowder smell which emanated from firing a roll of caps through the pistol – at the bad guys. The good guys always won, of course, when it came to dealing with outlaws. Of more concern, today, was our youthful perception of “cowboys and Indians.” In retrospect, it is not always so easy to separate the “good” guys from the “bad” guys on the Old West stage. Most of us, today, have no illusions concerning our history of the white man’s settling of the West – at the expense of native Americans. The romantic portrayals of “good and bad” in our media and in our national conscience were often cockeyed, and the notion of wild shoot-outs and impersonal killing with a firearm for the sake of entertainment were not the stuff of which to be proud now that we reflect on it. Human nature being what it is, and the entertainment industry being what it is, virtually everything about the western frontier was unduly romanticized and sanitized. Colt sold huge numbers of its flagship gun, the Single Action Army revolver, for good reason. Often, a man’s revolver was the only protection available against the numerous ne’er-do-wells on the far fringes of the frontier. His gun had to be quick and reliable. Firing cartridge bullets (usually the heralded Colt .45 caliber), the Colt SAA provided incredible advantages over the old percussion cap and ball, black powder revolvers which preceded it for decades. Those were clumsy to reload and shoot and not nearly as accurate as the SAA. The old black powder handguns were still the staple of soldiers in the U.S. Civil War, less than ten years prior to the 1873 introduction of the SAA. They were not only heavy and clumsy to reload and shoot, they were also decidedly homely looking weapons. 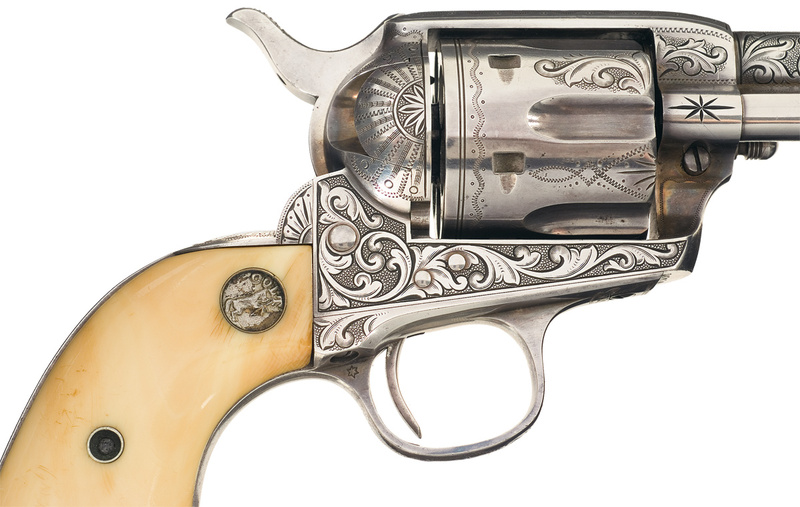 Due to its ease of use, reliability, and accuracy, the 1873 Colt Peacemaker was a revelation to its new owner, those merits reflecting the most important considerations in choosing any sidearm…aside from the initial cost. There is one other aspect of the Colt SAA that intrigues me and sets it even further apart from its nearest competitors, and that is its “beauty” – yes, I said beauty! Admittedly, handguns are generally ugly mechanisms, both in the emotional sense (for many) and in the physical sense. For me, the Colt SAA is a glaring exception which helps to explain its iconic status; its lines are classic and functionally straight-forward – even graceful. There is virtually no other product I can think of whose physical image and functional usefulness has withstood the test of time …over many decades. Think of the Model T Ford compared to today’s sleek Ford Fusion, for example. Think of cameras, of telephones, and of airplanes – from the biplane to today’s sleek jet fighter aircraft. 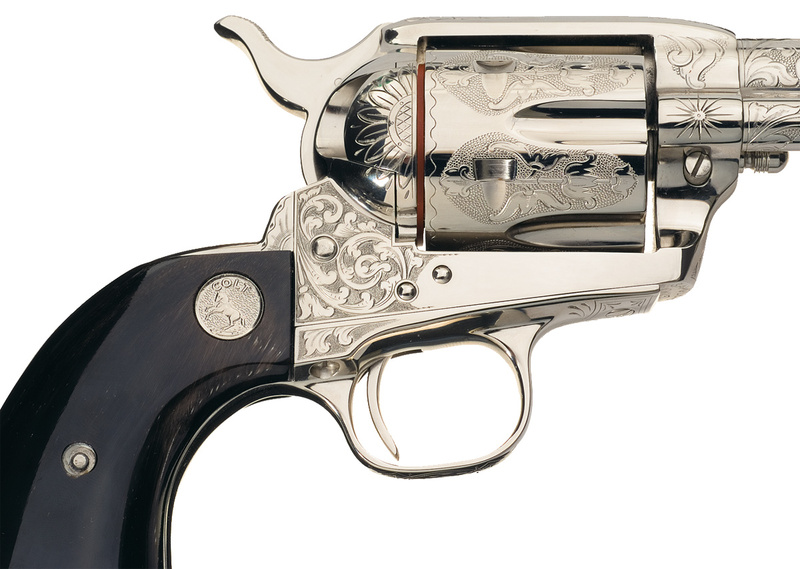 More than any other product that comes to mind, the Colt SAA maintains an aesthetic and functional appeal, very little diminished since its introduction in 1873. What other manufactured product can make that claim? The gun’s elegant, graceful lines reflect the straight-forward functionality of its design. Holding a Colt in one’s hand makes it easy to appreciate the heft and balance of its machined and polished steel assembly. As it comes off the assembly and finishing lines, a Colt SAA revolver inherently reflects the artisan’s touch of a fine machinist, where precision and fit are paramount. With the addition of a master engraver’s imaginative artistry graved into its fine steel finish, a Colt SAA becomes an artistic work of great beauty as the following pictures amply prove. A Colt third model “Dragoon” black powder pistol – the rather clumsy forerunner of the classic Single Action Army, Colt .45 revolver. 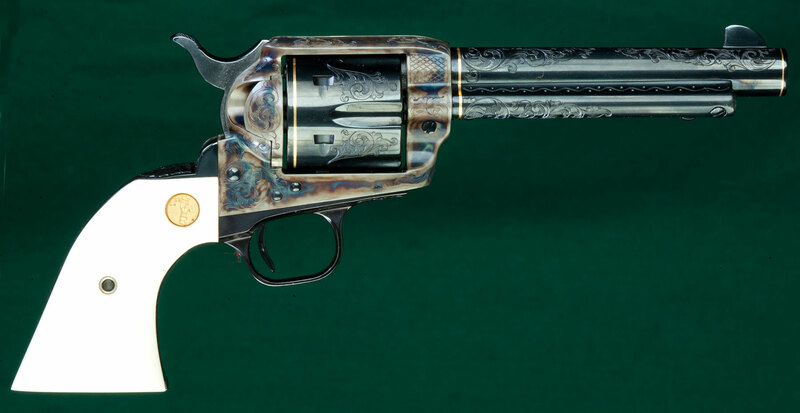 The Colt SAA illustrated at the very beginning of this post is the famed Sears and Roebuck “Cowboy Special” Single Action Army custom engraved at the Colt factory in the early nineteen-hundreds as a special order for Sears and Roebuck. The gun was fully engraved with fine gold line inlays and offered for sale in Sears’ renowned catalogue for a number of years as a marketing ploy – an attention-getter! The price must have been stiff, presumably to evoke comment, and the gun never sold after being offered for some years. Clearly, Sears had no intention to make money off its sale and wanted to keep it around for its publicity value. The revolver was put into a vault long ago and lay forgotten for many years – until it was rediscovered in the mid nineteen-fifties. At that point, it was offered to the famous singer and ardent Colt collector, Mel Torme, for $750. After much deliberation over the “stiff price,” Torme purchased it. Several years ago that same gun was auctioned by the auction house, James D. Julia Auctioneers of Fairfield, Maine, for $747,500! They provided the picture of it used, here, as well as a few others in this post. You now have some idea just how collectable Colt firearms can be, especially Colt factory engraved and inlaid SAA’s. 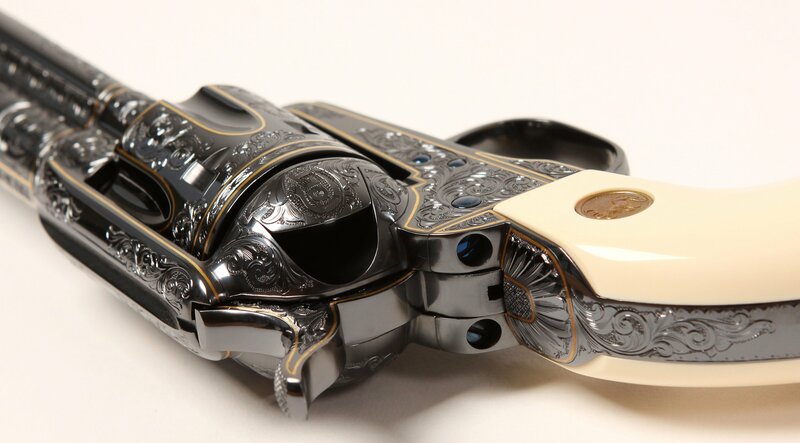 Especially coveted are those done by the handful of recognized master engravers employed by Colt back in its heyday – true artists who often spent their entire careers at Colt. Factory engraved Colts by Gustave Young, L. D. Nimschke, and Cuno Helfricht are very highly sought. The above cased presentation set containing an engraved No. 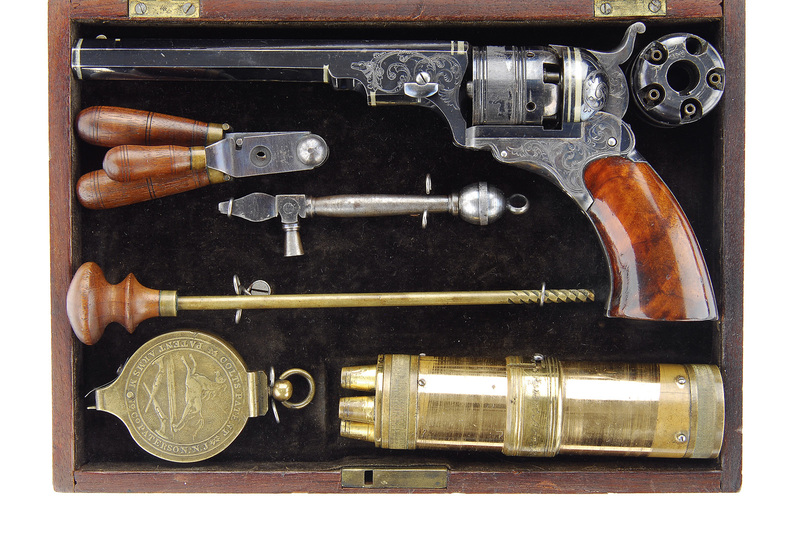 2 Colt Patterson percussion revolver and accessories was auctioned several years ago by James D. Julia Auctioneers, Fairfield, Maine – for the princely sum of $517,500! (picture courtesy of them). The very early Colt firearms carrying the “Patterson” designation reflect the Patterson, New Jersey location of Colt’s first factory. Before long, the Colt Patent Arms Co. relocated to Hartford, Conn.
Part of the lure of Colt firearms stems from the illustrious history of its founder, Samuel Colt. He invented the revolving pistol as we now know it, and organized the Patent Arms Co. in 1836. While his ground-breaking mechanical aptitude and talents revolutionized firearms design in the early nineteenth century, he also broke new ground in corporate marketing by skillfully promoting his products. The tradition of customized, cased, and factory engraved Colt sidearms which were presented as gifts to influential government dignitaries reflects Colt’s unerring grasp of effective marketing. Numerous examples of these presentation firearms still exist, today, and are highly sought. Collecting firearms like these is a pastime only for wealthy folks. Fortunately, for the rest of us, seeing them in collections and books and appreciating their historical and artistic merits costs next to nothing. For those curious about the meaning of the phrase “single action” reflected in the abbreviation, “SAA” of Single Action Army: On a single action revolver, pulling the trigger merely releases the manually cocked hammer, thus firing the gun. The cylinder revolves to the next bullet chamber when the hammer is manually cocked using the thumb. On a double action revolver, pulling the trigger both revolves the cylinder and fires the gun in one continuous motion. Most revolvers, today, are of the double action variety, although single action guns are still manufactured. For a fine, overall look at Samuel Colt and his famous firearms, I recommend the book: Colt: An American Legend by R.L.Wilson: Abbeville Press, 1985. 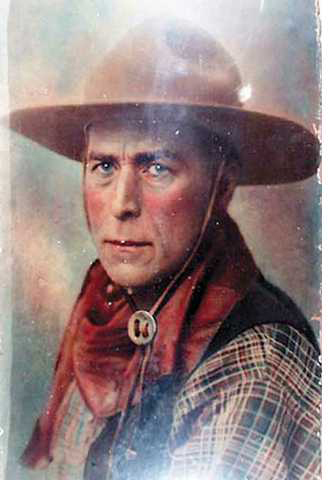 America’s first movie cowboy-hero was not Roy Rogers, Gene Autry, Hopalong Cassidy, or even Tom Mix: Meet William S. Hart, the forerunner of them all! 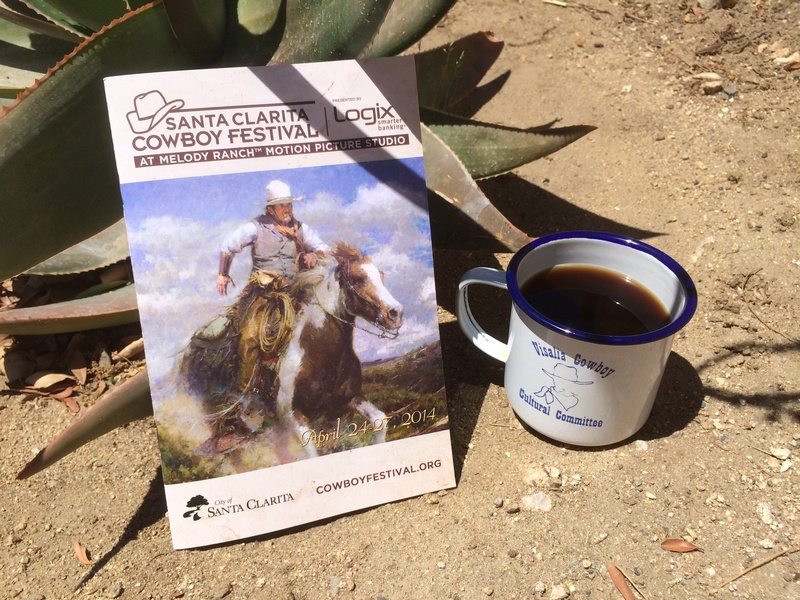 Linda and I attended our ninth consecutive Santa Clarita (California) Cowboy Festival last weekend. 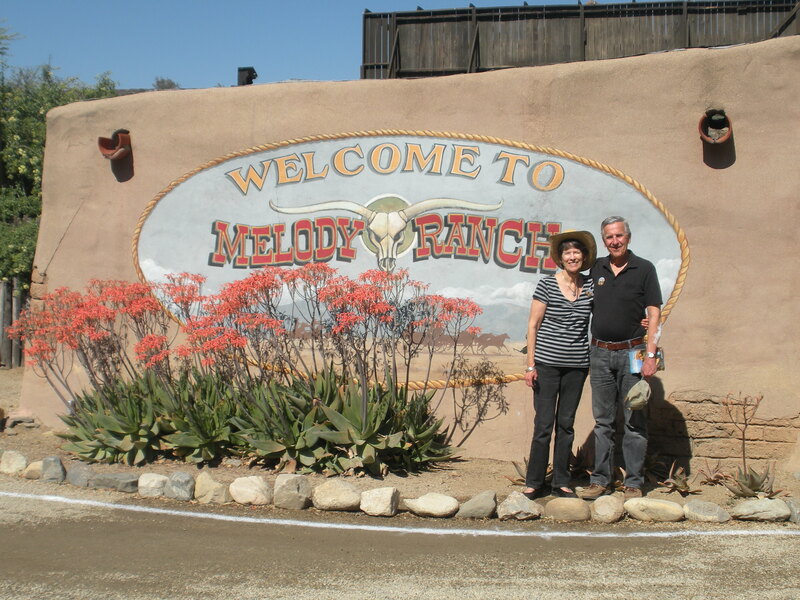 In past years, this was held at Gene Autry’s Melody Ranch where countless western movies were filmed over past decades. This year, the cowboy-inspired music and poetry extravaganza relocated to William S. Hart Park, in the nearby downtown of Newhall. 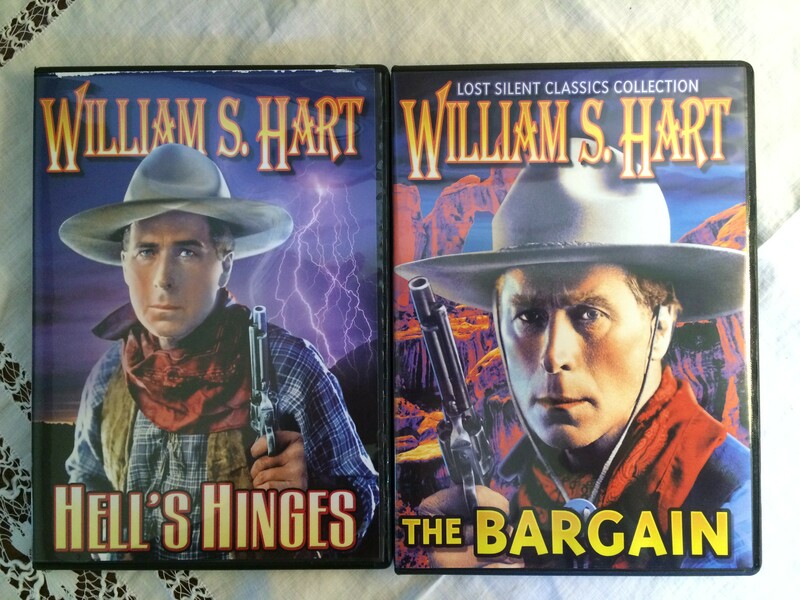 Both Gene Autry and William S. Hart are very well-known in these-here parts, as they say. Linda and I knew a lot about Gene Autry, but almost nothing of the shadowy historical figure, William S. Hart. Our visit on Sunday morning to the Hart “mansion” located on a hilltop perch within the park bearing his name certainly filled our knowledge gap! 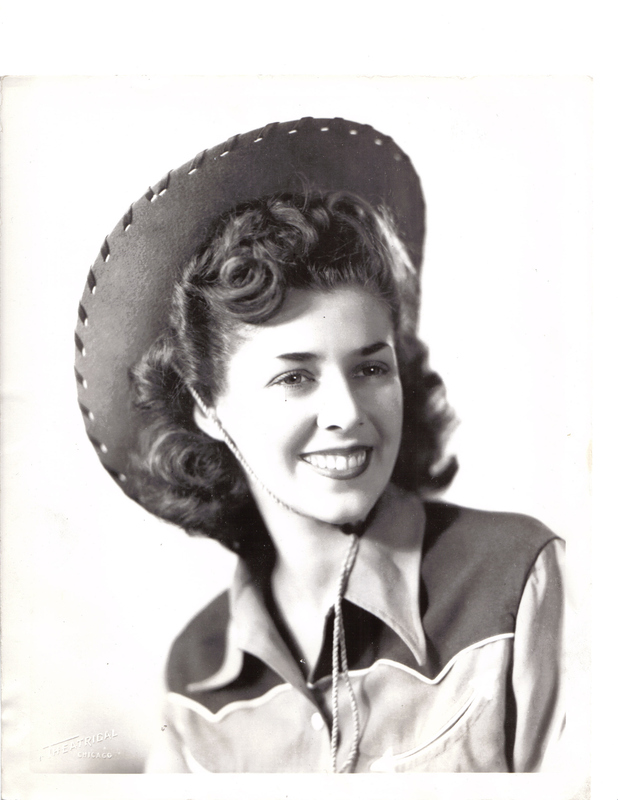 Linda wished to forego some of the musical feast which is non-stop at the cowboy festival in order to visit Hart’s home. We arrived early at the mansion after a bracing quarter-mile hike up a winding road. Perusing the hilltop environs of the house, I knew we were in for a fine experience when the doors were opened to the public. The mansion was built by Hart in 1926. He lived there with his sister until his death in 1946. 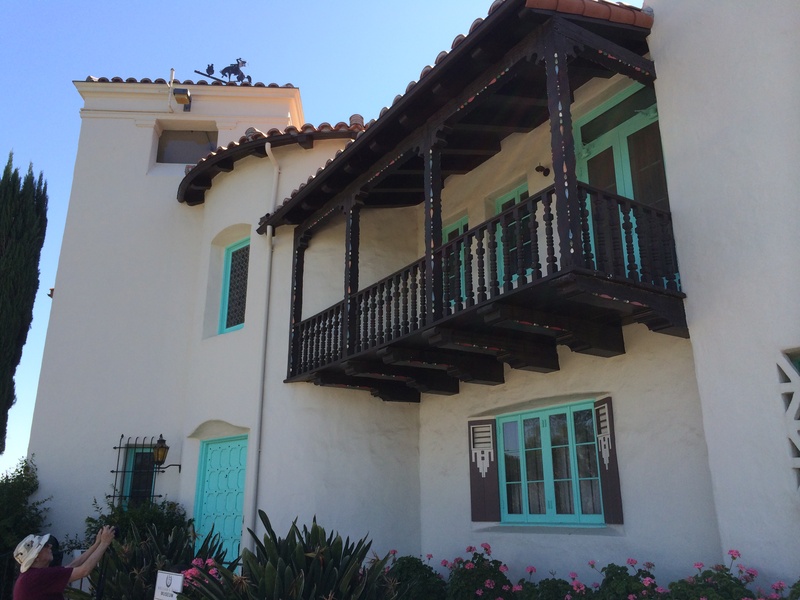 He bequeathed this house, along with his considerable fortune and land-holdings to the County of Los Angeles as repayment to the people who, through the years, spent their hard-earned nickels and dimes to see his movies. Hart was well aware that those nickels and dimes made him the successful and wealthy movie pioneer that he became. 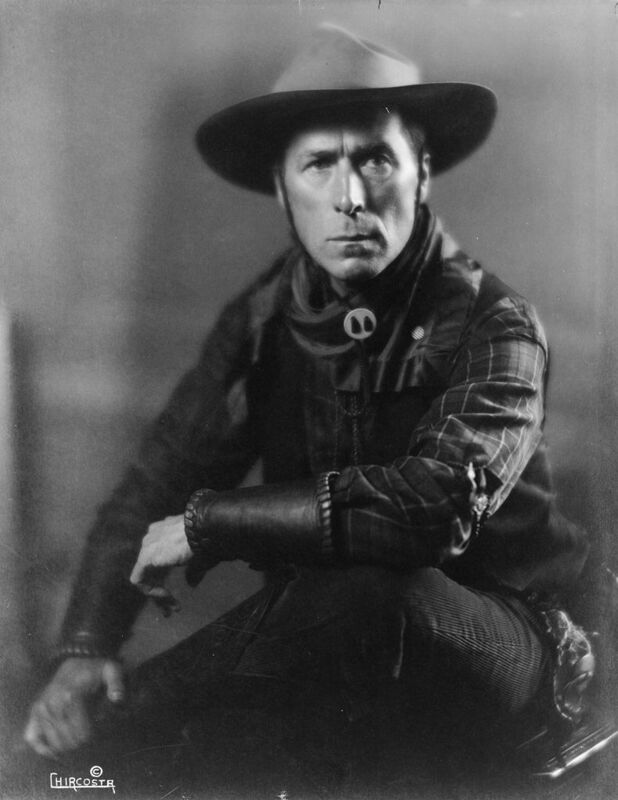 William S. Hart made his first western movie at the ripe age of forty-nine! Prior to that, he was a classical Shakespearean stage actor with roots on the east coast. His theatrical engagements took him far and wide across this nation, but he always harbored a special fascination with the wild-west and its famous characters. He was appalled at the cheesy sets, costumes, and acting of the early, silent cowboy films coming from Hollywood, and he determined he could do better. And he did do better, serving as actor, producer, director, and occasional screenplay writer. Hart’s cowboy characters reflected his own moralistic attitudes. 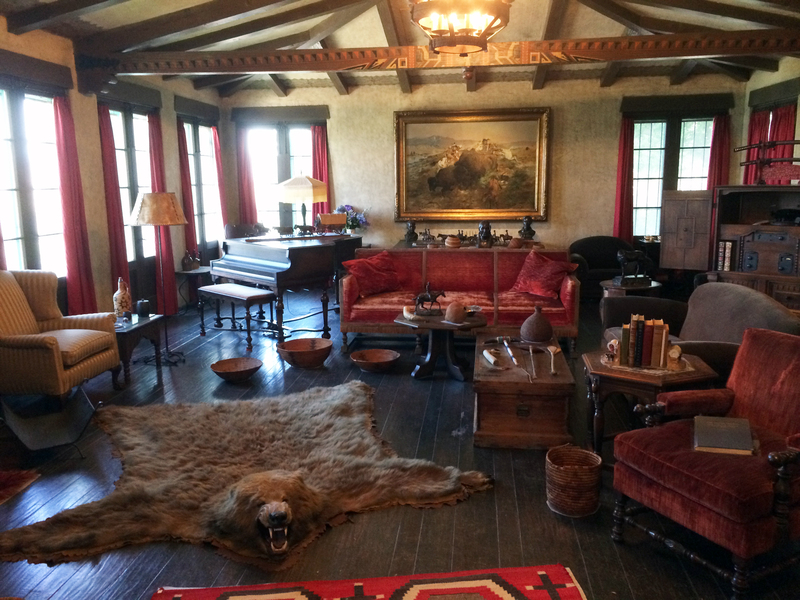 The docent at the house, who shared his extensive knowledge of Hart with my wife and I, spoke of Hart’s distaste for Hollywood’s portrayal of Indians as mere savages and for the cruelty exhibited toward animals “used” during filming. Shooting animals for the sake of sport repulsed him. His good friend, Will Rogers was the opposite of Hart in many ways. To goad his good friend, Rogers once presented him with a very large Kodiak bearskin rug (complete with head), and asked sardonically what he was going to do with it! Hart, both a respecter of animal life and a pragmatist, reasoned that the bear was already dead and there was nothing he could do about it except to display the remains of its former majesty on his living room floor! 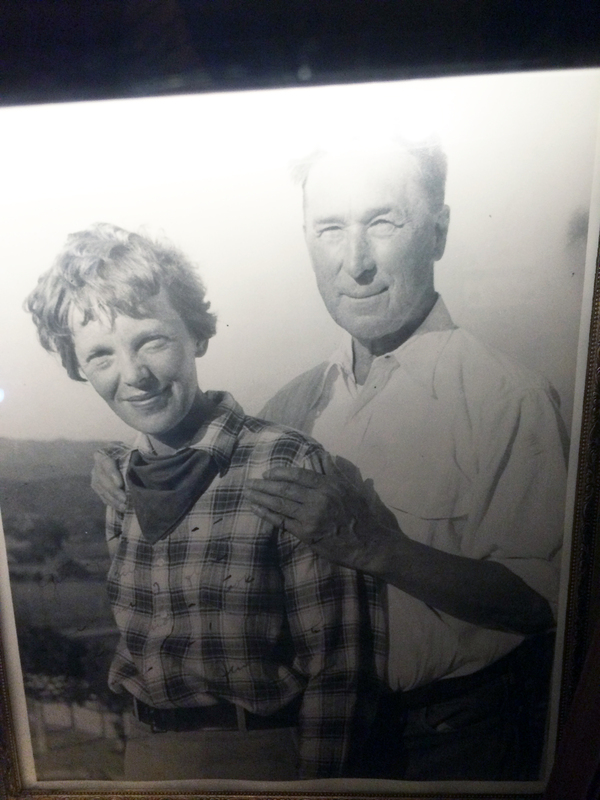 Another Hart anecdote from our tour docent involved the famous aviatrix, Amelia Earhart. Soon after moving in to his newly constructed home in 1926, the peace and tranquility of his hilltop haven was severely disturbed by a lone, private aircraft which suddenly appeared one day, and leisurely circled his home for some period of time. With his anger building over this pesky “aluminum fly” circling round and round overhead, he noted the requisite “tail number” of the aircraft and went to the Newhall sheriff to register his complaint. Three days later came a knock on his front door. Hart was startled to be face-to-face with Amelia Earhart who had come to apologize for her transgression! They soon became good friends. Hart was also friends with the great western artist, Charles Russell, as well as the frontier legends, Wyatt Earp and Bat Masterson. Early in Hart’s career, he had obtained the pistols which belonged to that most famous of outlaws, Billy the Kid. 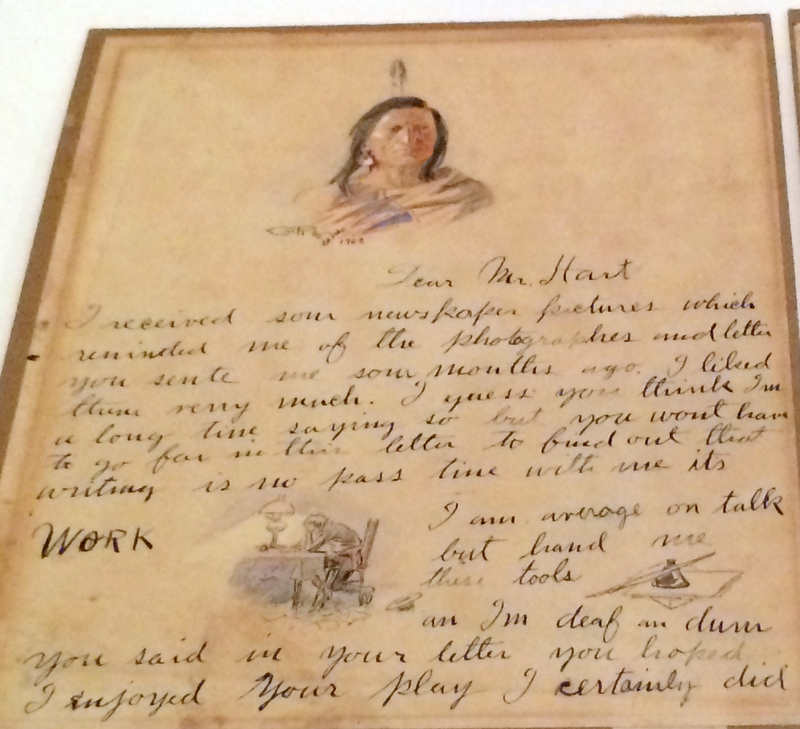 An interesting letter from Charles Russell is displayed. Russell invites Hart to come see him if his travels bring him “near his campfire.” In rather clumsy syntax, Russell confesses how ill-at-ease he feels expressing himself with pen and paper. He “writes” using his artist’s tools; indeed, the letter is peppered with little vignette jewels from the artist’s fine hand. Hart made dozens of films from 1914 until his last movie, Tumbleweeds, in 1925. His only sound film was a 1935 reissue of Tumbleweeds which featured a spoken prologue by Hart. Retired from film by 1926, Hart spent the final years until his death in 1946 writing books with a western theme. The newer, flashier breed of movie cowboy successors had, by the early nineteen twenties, replaced Hart and the darker, more serious western dramas pioneered by him. Careers (and lives) are typically short-lived in Hollywood. That was true of Hart’s movie career, as well, but his presence and the innovations he brought to western film-making earned him a justly deserved star on the Hollywood Walk of Fame. For a time, his star burned very brightly. Visiting his home, one sees the reflection of a life which valued tradition over trendy, sensible over excessive, contemplative over ostentatious. 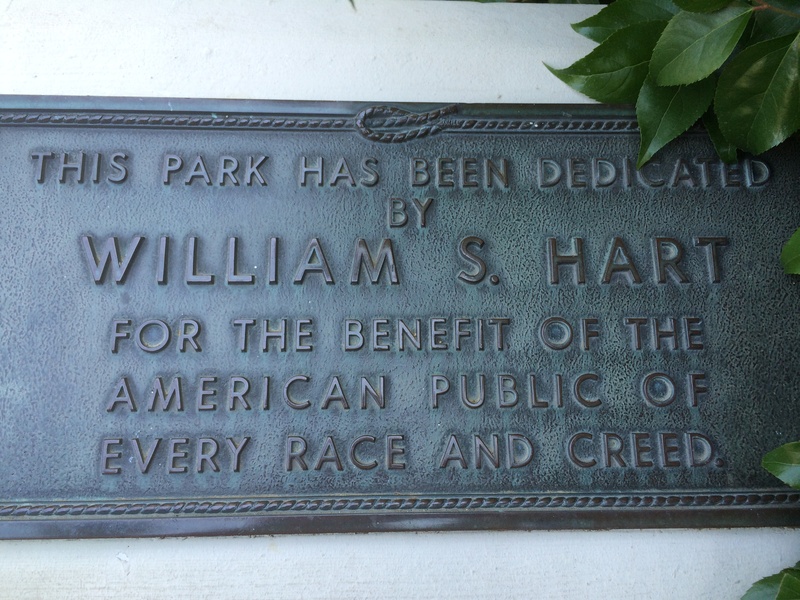 For me, the visit and our introduction to William S. Hart was a pleasant, fascinating experience. If you are ever “near his campfire” in Newhall, California, be sure to pay him a visit. 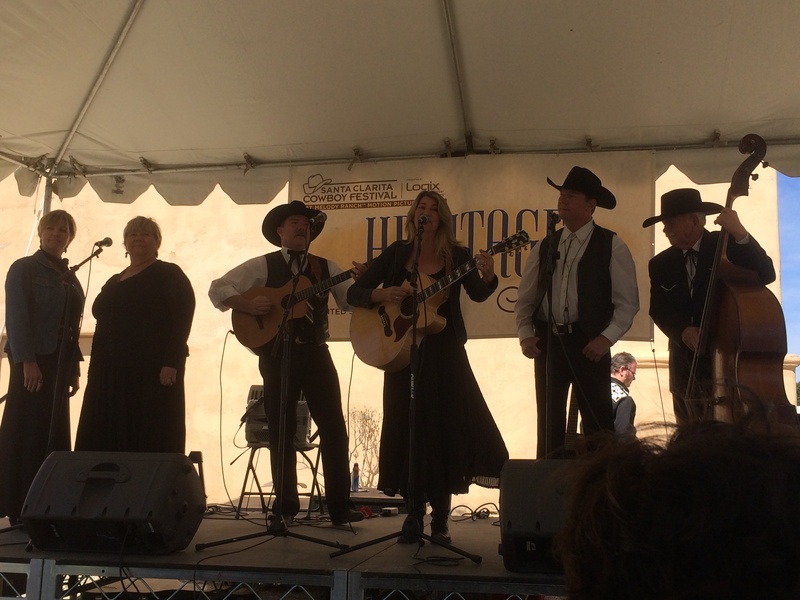 Last weekend, for the eighth consecutive year, we kicked-up our heels at the Santa Clarita Cowboy Festival. 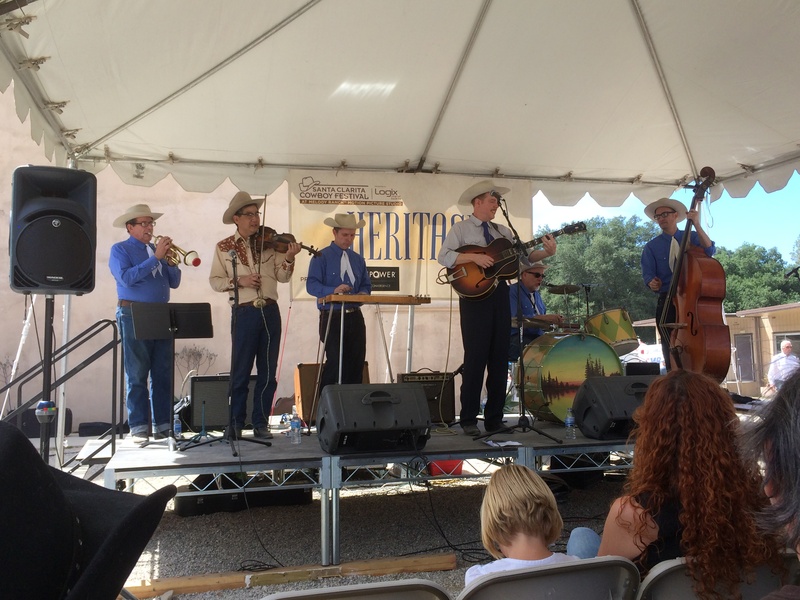 The pilgrimage to Gene Autry’s Melody Ranch at Santa Clarita, California, never fails to rejuvenate its large audiences through music and cowboy “poetry,” all tantalizingly served-up by some of the best professionals in the genre – anywhere! This feast for the audio (and visual) senses takes place on the Melody Ranch movie lot, formerly long-owned by that most iconic of all movie cowboys, Gene Autry. 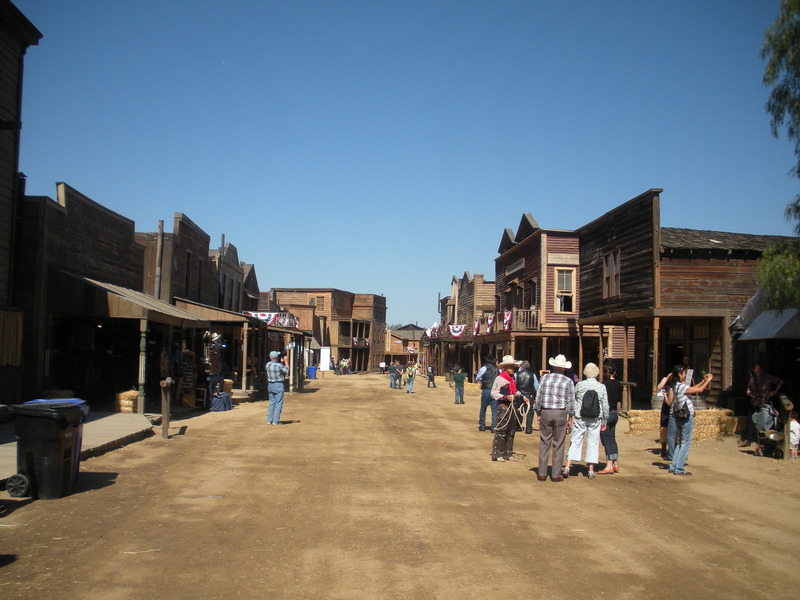 There are several sizeable venues located around the scenic ranch whose central feature is the obligatory old “Main Street” of town, the scene of countless cowboy films and television productions. Many of Autry’s old films were shot there; the iconic and very popular television series, Gunsmoke, was filmed there as well. The very “best of the best” entertainment at Santa Clarita takes place on the Melody Ranch Stage, situated in a gigantic tent which is capable of seating a very large audience. There are several smaller, partially-covered venues scattered around the grounds which offer a rarely- encountered intimacy between performers and audience. Our first time at this festival, eight years ago, triggered flashbacks in my memory of the very first cowboy/western music I ever heard – at six years of age, back in Chicago. 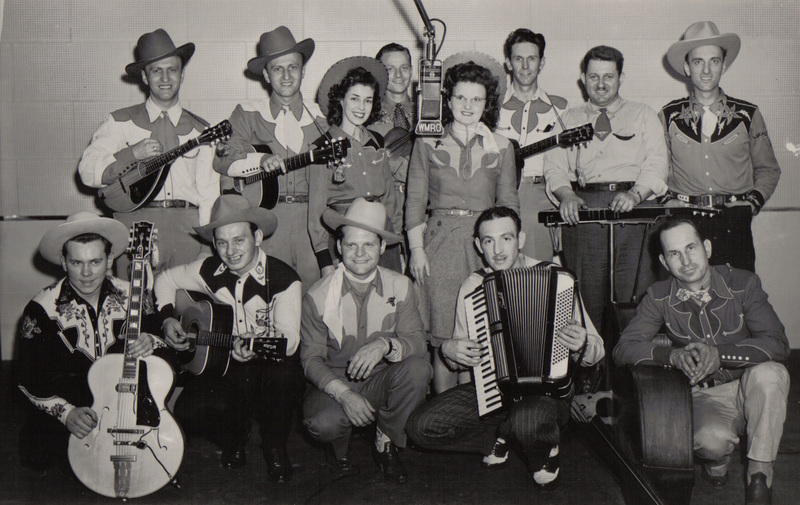 Anticipating last weekend’s festival, I wrote of those impressions made by the Circle-J Ranch group, way back in 1946 (See my recent post of April 20, 2014, Cowboy/Western Music – from Chicago). 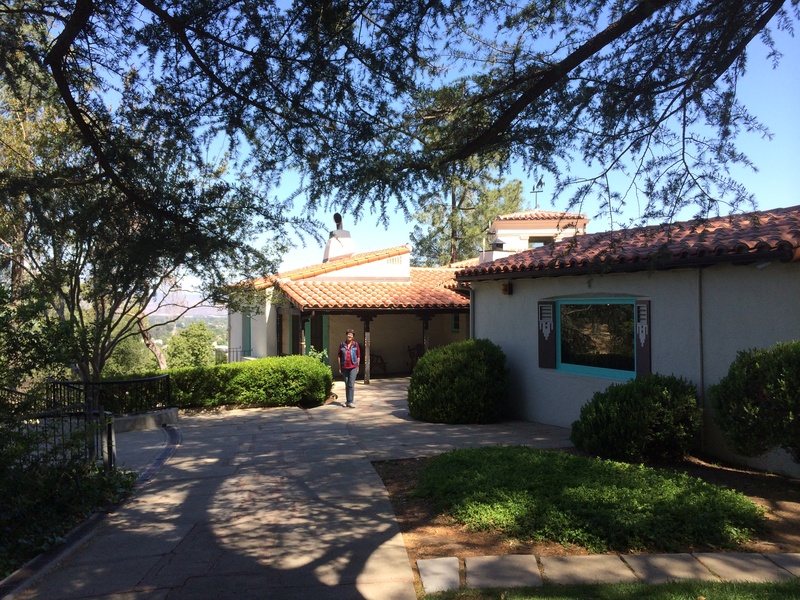 The Messick family is one of the perennial favorites at Santa Clarita – a local family group that exudes both musicality and joy at each performance. That is the patriarch, Wayne Messick, on the bass fiddle, extreme right. He is in his eighties and still going strong. Being local and family, they perform only occasionally compared to the busy yearly schedules of virtually all the other professional acts. They lend such a nice touch to the musical festivities at Santa Clarita. It appears there are Messick grandchildren involved in music who may continue the tradition! 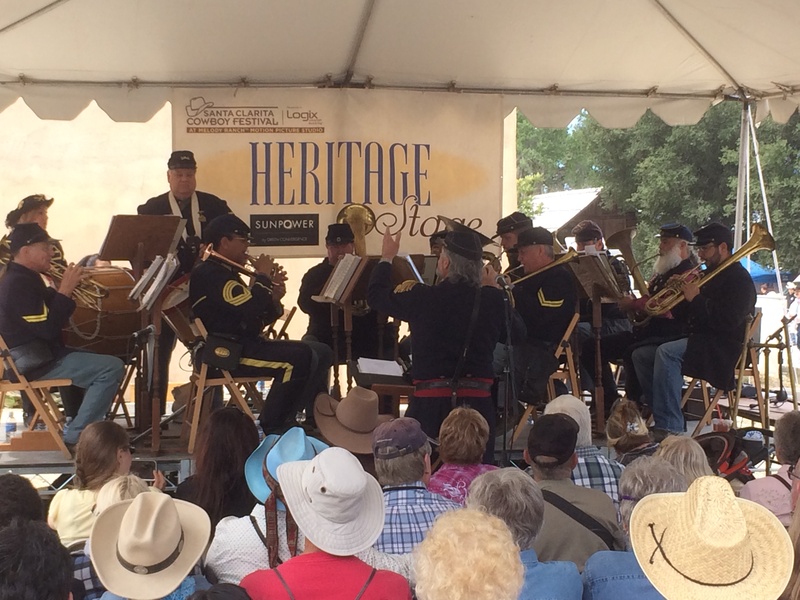 The California Battalion is a period “band” from the days of the U.S. Civil War. The group specializes in re-creating the music and researching the traditions that are on display during their performances. They play authentic period brass instruments, and they do so in stirring and often humorous fashion. You might notice that the trumpets and other brass pieces seem to be pointing in the wrong direction – backwards! The battalion leader explains that, because the regimental bands always marched up-front of the troops, the instruments were pointed south for the benefit of the soldiers and their morale. The trumpets also have rotary valves, not the “plunger” type valves we see today. My wife and I encountered one of the trumpet players and a few other band members who were strolling about the premises between performances. Being a trumpet player myself, I asked about their instruments and how they acquire them. We had a nice discussion on antique band instruments. The point to be made, here, is the informality of the event and the venues. One often encounters even the “star performers” casually strolling about the grounds; we have often greeted them and engaged them in conversation. They have always been gracious and pleased to meet the public. There are few such venues anymore, sports or entertainment, where audiences can meet and even get to know the performers they come to watch. Main Street, early in the morning before the crowds arrive! 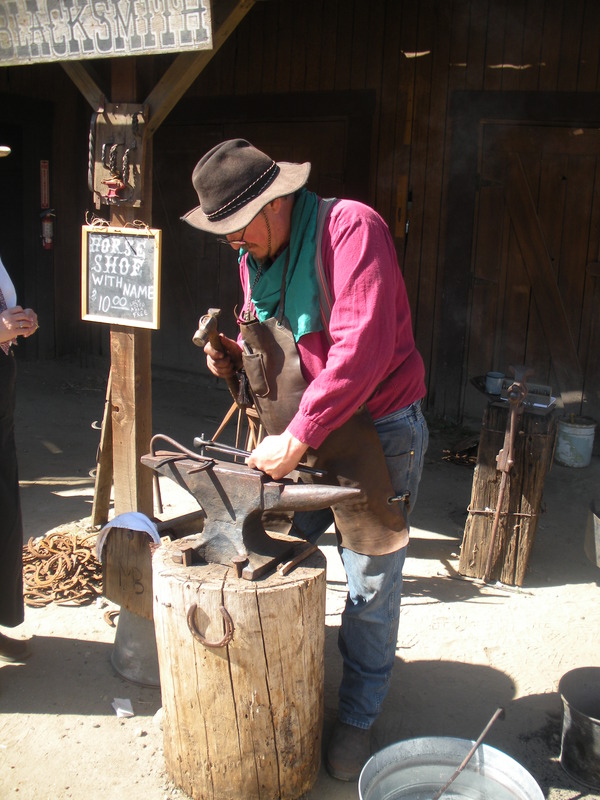 There is a lot to see at Melody Ranch during the festival. 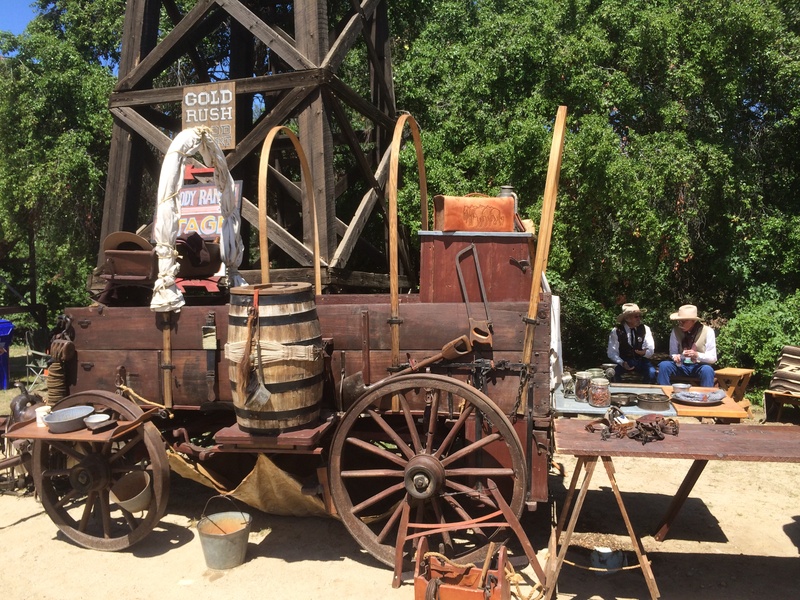 In addition to the live entertainment, one can stroll about and absorb the aura of a real western film location complete with numerous and eclectic movie props scattered about the premises. For a closer look, one can visit the Melody Ranch Motion Picture Museum located just a short stroll from the entertainment venues. They make a big deal over cowboy cobbler…and no wonder – it is absolutely delicious! Try to limit yourself to only one bowl per each of the two days of the festival…good luck! And we always opt for an endless, two-day supply of cowboy coffee by buying the mug for eight dollars. 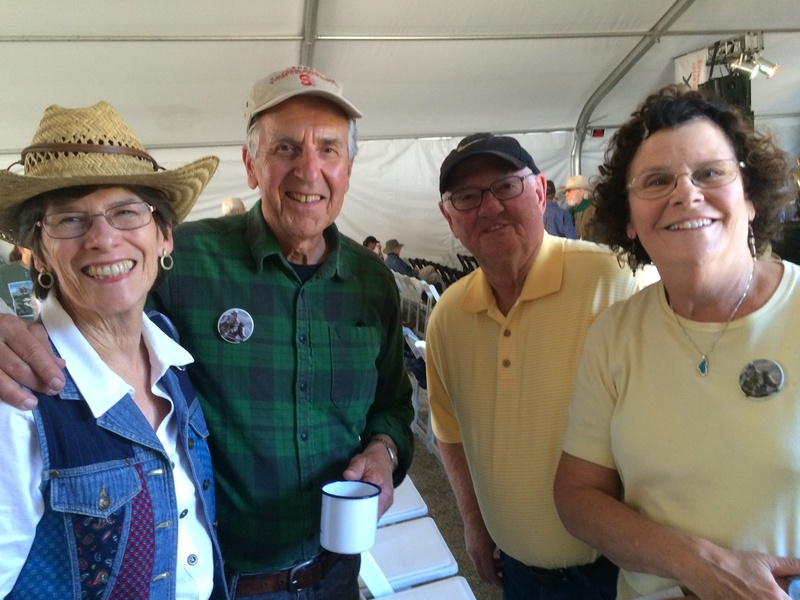 The coffee is served, cowboy style, from pots hung over coal fires – by authentic- looking cowboy volunteers. Note: fans of weak coffee need not bother! The mug in your hand is your endless coffee pass for the entire festival; each year the cup changes color. Great fun! The Steel Guitar is Back This Year! This year we saw a group called “The Lucky Stars” which had not been at the festival since we started attending. They were great – a nice surprise, especially since they featured a swinging steel guitar. For me, nothing accentuates cowboy/western music like a steel guitar. The first one I had seen since the Circle-J Ranch back in Chicago so many years ago surfaced here, last year, in the person of Bobby Black, one of the venerable legends in western music on steel. He was not here this year, but Rusty of The Lucky Stars did a fine job on the instrument. Pure joy! 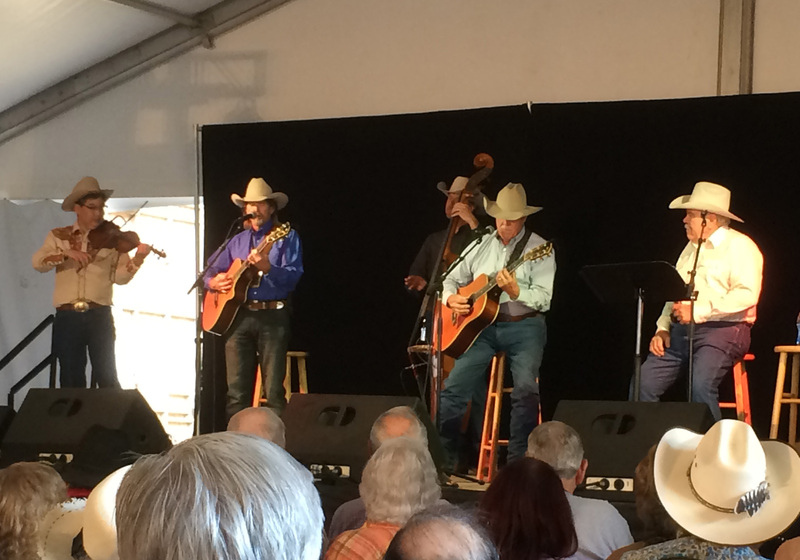 We, once again, saw two performances that are an annual “must” at the Cowboy Festival. The “Sons of the San Joaquin” (as in the California valley, north of here) have resided at the top of the list of best acts in cowboy/western for some time. Joe Hannah joins with his younger brother, Jack, and Joe’s son, Lon, to produce the sweetest harmony this side of …anywhere. Jack and Lon play guitar, but Joe has relinquished his base fiddle to newcomer Dan Kahler. Rounding out the Sons is Richard Chon who plays the most beautiful fiddle accompaniment one could possibly image. Richard can effortlessly “saw” and stomp his way through the most challenging up-tempo pieces in the program, then turn around and play the most plaintive, singing fiddle imaginable; I think he must have a Stradivarius masquerading as a fiddle! When you listen to his musical interplay with the Sons on the slower pieces, it is difficult not to tear-up – it is that beautiful. Jack Hannah is the consummate voice and leader of the group. His deep baritone voice is truly something to behold. 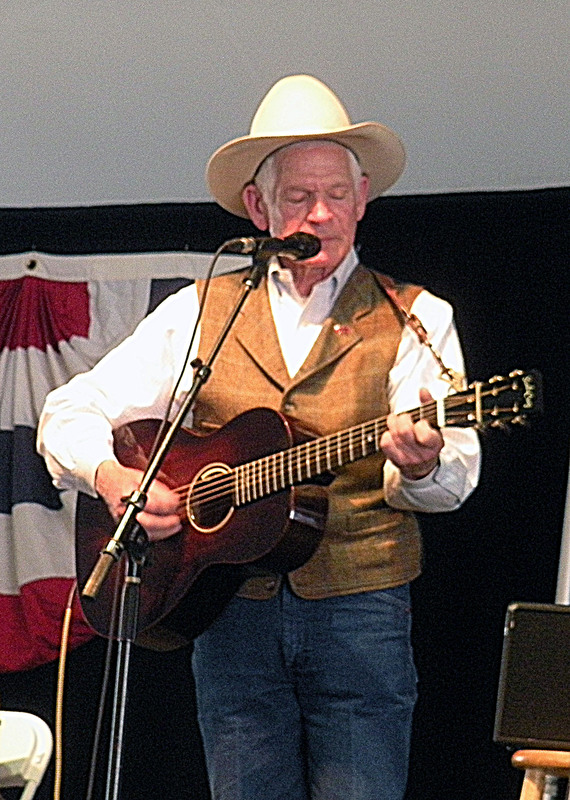 He is also a renowned songwriter with many fine ones to his credit. Last, and simply the best at what he does, is Don Edwards. His performances involve just him, his guitar…and the whole audience. His vocals always deliver a message, a message which connects with every person in the tent. 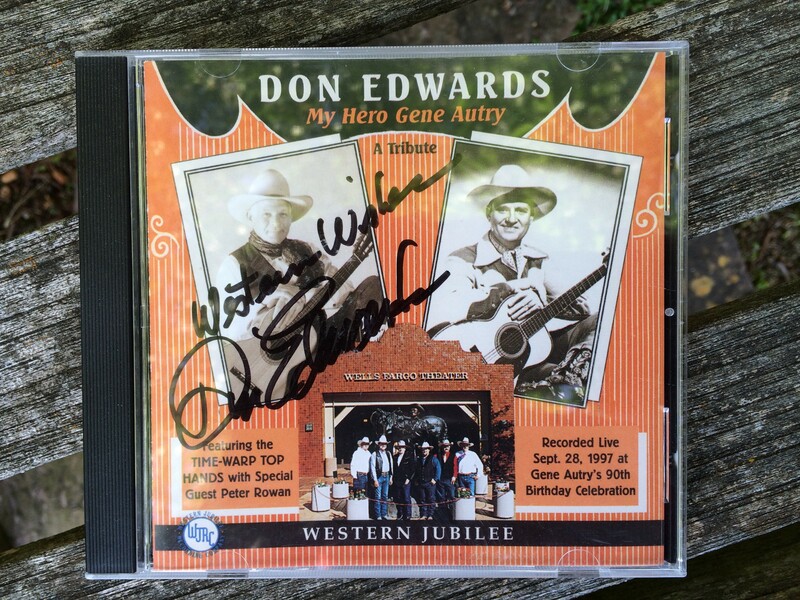 That genuineness along with a great voice, diction, and superb guitar playing are the essence of Don Edwards. He chooses his songs carefully and well. He is never a “showman.” He is always a consummate professional who has researched much of the cowboy lore of which he speaks and sings. Seeing and hearing him perform on the big stage in the big tent – yet still up-close – is a memorable experience. One more thing about Don: He hates yodeling, but he does it well and usually inserts one short segment to please the crowd. Thanks, Don. Thanks also to our dear friends, Gil and Linda (on the right) for convincing us to attend our first festival. 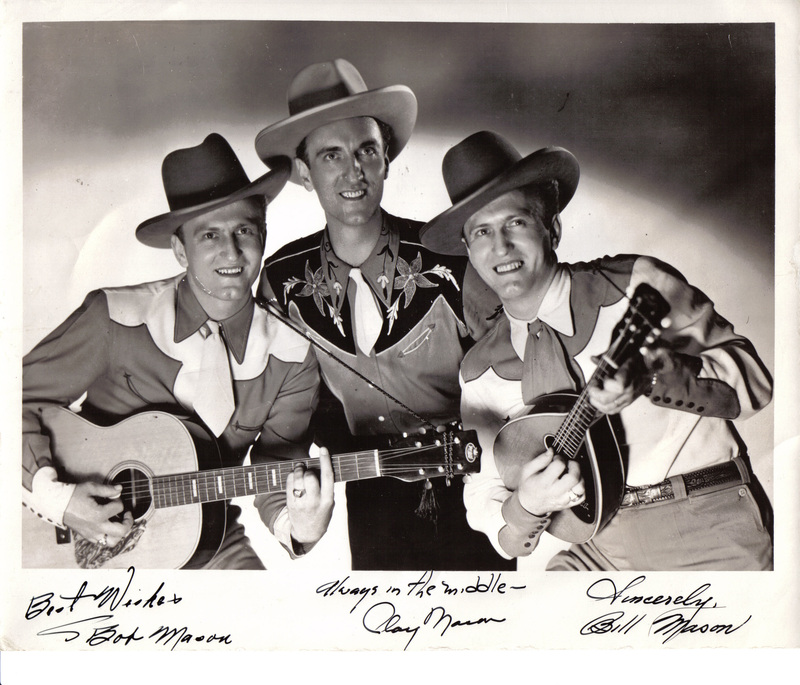 They waxed so enthusiastically about the music…and the cowboy poetry? That poetry part scared me off, initially. There are a few performers who deliver soliloquys on cowboys and life on the range. They tend to have ranching backgrounds and know of what they speak. Some of the recitals are very touching; some are downright hilarious. I will admit that I go for the music which predominates and cannot be beat. Thirty dollars per person will admit you for both days, allowing access to the several venues which operate all day. What a deal! Cowboy cobbler and cowboy coffee are extra!! Disclaimer: No, I am not a marketing front-man for the festival or for any of the performers or their products. I am merely a happy consumer of what they offer who would like to share the joy. That is my idea of what a blog should be. See you next year at Santa Clarita!